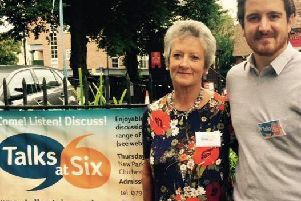 A writing partnership which was forged in Sussex now returns to Sussex. Ian Hislop and Nick Newman were at school together at Ardingly. After the success of The Wipers Times last year, they are back in the county with their latest collaboration, Trial By Laughter which tours to Chichester Festival Theatre from February 4-9. And their writing together has continued ever since, including five years on Spitting Image, Harry Enfield and Chums, and My Dad’s The Prime Minister, as well as the film and play A Bunch of Amateurs. They have also written numerous comedy series for Radio 4. “We have always been together physically in the same office, and that’s where the fun is,” says Nick, an award-winning cartoonist who has worked on Private Eye since 1981 and been pocket cartoonist for The Sunday Times since 1989. The point for Ian is that they both have different takes: “What you can do with dialogue when you are writing together is that you are effectively editing it as you go along. You realise that something doesn’t quite work or needs to be changed. But also it is a much more enjoyable and much more efficient way of working. As for the latest piece, it tells of the trials of William Hone, a bookseller, publisher and satirist. In 1817, he stood trial for ‘impious blasphemy and seditious libel’. The only crime he had committed was to be funny. Worse than that he was funny by parodying religious texts. And worst of all, he was funny about the despotic government and the libidinous monarchy. Along with his great ally, political cartoonist George Cruikshank, Hone sought vindication for his laughable offences and fought for freedom in one of the most remarkable legal cases of its time – one which Ian and Nick are recreating. The point for both is that Hone’s fight for free speech is a fight which continues to be fought. The need for satire remains as acute as ever.